X6, 19 Sep 2010iphone 4 has the "BEST" camera??? LMAOROFL HAhaHaHaHAhAh!!! pathetic...only stupid ppl thk megapixel shows camera quality. lens and sensor is more important. 3mp is enough for mobile phone but iphone4 camera always welcome for it's pixel upgrade. compare iPhone photos with evo and u know th difference. compare video recording too. iPhone records clear smooth and best sound quality u can chck at tube. htc is poor man iPhone. android concept starts fr poor man's iow haha. [deleted post]you have issues...most technology companies buy Samsung products (display, memory etc) for their own products. which means the winner is Samsung. Anonymous, 19 Sep 2010If HTC is so "innovative" why do they use Samsung displays? Why does Apple use Samsu... moreWhy can't they use Samsung displays? It doesn't mean they aren't innovative. To me, true innovation in smartphones is software. Aside from Apple, HTC was one of the few other companies that recognized the importance of user interface early on in the game. Samsung, LG, etc are still catching up in this regard. [deleted post]Why are you putting down other races for, this is a forum about htc roms and bench mark. You are the worst race here. IMO, Desire HD's Quadrant numbers are pretty good. Its quite a bit higher than the initial numbers Galaxy S received. Not sure how much more XDA developers will be able to squeeze out, but I like what I am seeing about Desire HD's hardware. 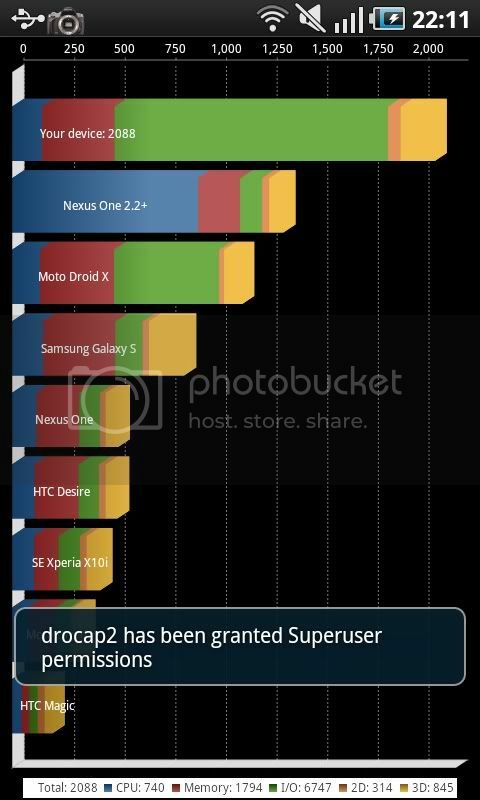 On a side note, HTC HD2 is doing REALLY well on these benchmark numbers, especially considering that it is not an Android phone! Dell user, 19 Sep 2010 HTC= innovation Samsung = copy cats That's the huge difference between HTC and Samsung... moreIf HTC is so "innovative" why do they use Samsung displays? Why does Apple use Samsung processors and video chips? one of the greatest android devises !! That's the huge difference between HTC and Samsung, and that's the reason why I respect HTC way better than samsung. HTC are not dieing to be another iphone in the marker, HTC are creating a new identity for themselves! Anonymous, 19 Sep 2010I agree with that you say except one thing. About nokia being late to the camera game. I'm sur... moreI can't believe you didn't say "N82", the KING of cameraphones for 2 years u.u..
give us HTC DESIRE HD MINI 3.5" with same 1ghz CPU, touch sensitive control and dual led flash, you will sell like peanut, HTC!!! I wouldn't buy a brick with 1,230 mA battery! X6, 19 Sep 2010Agreed on the samsung 8mpix snapper..but nokia is late in the camera game, and although 8 Mega... moreI agree with that you say except one thing. About nokia being late to the camera game. I'm sure you've heard of the nokia n73, n81, n80, n85, n86 and the famous n95? Nokias been in the camera game for a while, they've just been slow on upgrading their megapixels that's all.......I think HTC needs to talk and pay royalties to nokia and use their camera technology in the picture and especially the video recording department. Even HTC fanboys know that their video recording capabilities are nothing short of mediocre. I seriously can't wait to get my hands on this, the build quality looks phenomenal! !, puts an Galaxy S to shame. And love what they've done with the new sense....,blazing fast boots up in under 5 seconds. Anonymous, 19 Sep 2010I dont think he's heard of the nokia n8....even the samsung innov8 that came out like 3-4 year... moreAgreed on the samsung 8mpix snapper..but nokia is late in the camera game, and although 8 Megapixel has been around for quite long, N8's photos & HD videos are pure awesome. i saw video/photo samples (especially video) from the N8 compared to iPhone 4 and N8 wins hands down in the colour quality, contrast...etc..and surely other 5 megapixel+ snappers surpasses iphone's cam performance. Im using a nokia X6 now and it might not be as fast or have the UI or the hardware like other phones in the market, but it gets the job done and it fits into your pocket like a PHONE unlike some bulky flat mass.